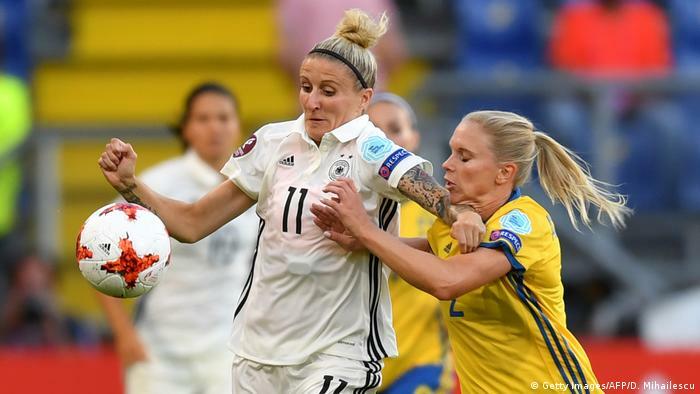 Germany defeated Russia 2-0 to lead Group B as Sweden fell to a shock defeat in the hands of Italy at the ongoing 2017 Women European Championship. The Germans would now face Denmark in a quarter final pairing while Sweden are set to trade tackles against Group A leaders the Netherlands. The thrilling duel between the Swedes and the Italians happed in Doetinchem. LottaSchelin opened scoring through a penalty kick before Daniela Sabatino leveled. StinaBlackstenius scored in the 47th minute to send the Italians back ahead but Sabatino equalized again. With minutes left to play Cristiana Girelli added the third to seal victory for the Italian women side. The loss meant Sweden finished second in the group to face another group winner. Had they won the game as expected they would likely have ended up leaders and face a second place team from another group. The Germans too advantage of the situation to lead the pack. The reigning champs dominated their opponents in the game played in Utrecht. The Russians rarely got a shot on target but the Germans had to rely on two penalties to win the game. Babett Peter and DzseniferMarozsan converted the spot kicks, beating keeper Tatyana Shcherbak. The Germans had seven points in total while Sweden finished with four points. The last eight games are set to happen on July 29th. In other results, England and Portugal qualified from their group. The Lionesses defeated Spain 2-0 to book their spot in the knockout stage while Portuguese side defeated Scotland 2-1.